It all started with the disappearance of the world’s greatest detective, Sherlock Holmes, nearly two months ago. Since then, crime has been on the rise. Supervillains have been looting major cities, scientists and public officials are being abducted at an alarming rate, and there has even been mention of giant mechanical monstrosities terrorizing the citizens of the world. Law enforcement seems helpless in the recent spat of major crimes. Truly, it is a wonderful time to be an evil genius. Luckily, you are one! From the nefariously creative minds of Eric M. Lang and Antoine Bauza comes Victorian Masterminds. Set in a steampunk era, when the rule of law has been suspended, players become criminal entrepreneurs, looking to take advantage of the current state of chaos. The only thing standing in their way is their illicit competition. The goal of the game is to collect the most victory points, but will they get there by completing their Infernal Machines? Or Capturing the great buildings of the world? Perhaps they will gain points through Missions, or kidnapping Scientists. There are many paths for victory! Criminal masterminds can’t be expected to do all the dirty work themselves, so each player has a team of Agents at their disposal. They will be sent out to one of the five major cities, London, Washington, Rome, Paris, and Moscow, to do the bidding of their master. Each different Agent has a specific ability, like the Henchman, who attempts to complete Missions, or the Gunner, who tries to capture Buildings. On a turn, the active player draws the top Agent token off their pile and secretly looks at their special power. Then, they deploy the Agent to one of the five cities. If the Agent placed is the third in a location, gameplay is paused and the city is resolved. The stack of Agents is flipped and players get rewards for their efforts. From top to bottom, the Agents earn spoils from the city, like Copper Plates, Bolts, or Scientists. Then, each Agent will attempt to complete their special ability. However, they have to be careful. If a Saboteur Agent is in the stack, they will stop the next Agent below from using their Special Ability! There are four different Buildings that can be captured from each city. Universities, Factories, and Furnaces are all worth victory points, and earn players a resource like Scientists, Bolts, or Copper Plates when they’re acquired. Monuments earn Mayhem Tokens, worth an additional two Victory Points at the end of the game. All those collected resources are going to help with the construction of their Infernal Machines. Each villain has had a dream since their youth of building a giant, death-dealing contraption, and now’s their chance! Players start the game with an Infernal Machine sheet that has the blueprints for their design and the resources requires to make it a reality. As they complete sections, they’ll earn rewards. The Machines start with a basic Power, but as they’re completed, they can unlock bonus Powers. The Infernal Machines also have holding cells to keep captured Scientists. Scientists can be discarded to perform special actions. One Scientist allows players to place a discarded Agent token. Two Scientists will grant the active player a second turn. Finally, three Scientists allow players to capture a Building from any city on the board, regardless of firepower. Being nerdy, or at least capturing nerds, has its advantages! Despite a general incompetence, the Secret Service is still working to bring the Victorian Masterminds to justice. The Secret Service Board represents the current level of research and strength that they have. Whenever a Gunner attempts to capture a Building, they’ll compare their firepower against the Secret Service Board and only gain the Building if they have the higher strength. Every time a Building is captured, the Secret Service Board level goes up by one, making it harder for the next criminal to snag a vulnerable piece of architecture. The end of the game is triggered when either a player completes their Infernal Machine, or the Secret Service reaches the highest level. Each player gets one more turn, and then points are totalled. The evil genius who has acquired the most points throughout the game will be declared the winner and a true Victorian Mastermind! 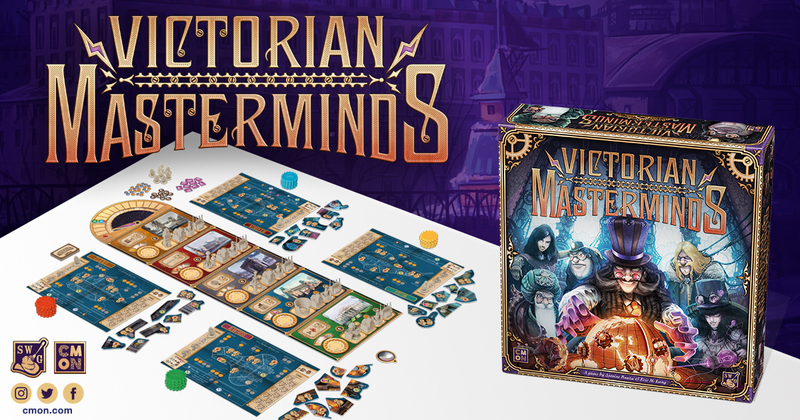 Victorian Masterminds will be in your FLGS on January 25. This article originally appeared in GTM Magazine.